Avocados are a creamy, rich fruit that are packed full of nutrients. The avocado has been gaining in popularity lately. This is thanks to food bloggers and Instagram influencers – who enjoy avo everything on toast, by blending into smoothies, or even as a pizza topping. There are many health benefits to eating avocados. A rich source of nutrients, one avocado contains 56% Vitamin B5 along with 41% Folate for synthesising and repairing DNA. 42% Copper can help to transport red blood cells, preventing anemia. 40% Vitamin B6 can support a healthy brain and nervous system. 35% Vitamin K is essential for bone health and preventing fractures, while 22% Vitamin C can provide powerful antioxidant support that is crucial for supporting serotonin. Avocados are a rich source of antioxidants, carotenoids and phytochemicals that can fight cancer. Studies shows that avocado can combat cancers like acute myeloid leukaemia (AML). One study from 2007 found that avocado contains phytochemicals that encourage cancer cells to stop growing and die. A study in the “Journal of Nutritional Biochemistry” reports that avocado extracts inhibit the growth of prostate cancer cells. This study concludes that the combination of antioxidants in avocados, rather than an individual antioxidant, is the key to reducing cancer risk. Monounsaturated fats and soluble fiber found in Avocados can support and regulate blood sugar levels, making them ideal for diabetics and people with insulin resistance. A high amount of soluble fiber found in avocados can help to keep your blood sugar levels stable. Avocados are also low in sugar and carbohydrates compared to other fruits…an this is not raising blood sugar levels in the first place. Rich in soluble fiber, this keeps the digestive system regular, supporting healthy bowels and intestines. Avocados are also high in magnesium and potassium that can prevent constipation by sending more water into your digestive system. An excellent source of Lutein, this carotenoid can reduce macular degeneration and cataracts risk. Fat intake from avocado along with the carotenoids can also greatly improve the absorption of nutrients around the body…including the eyes. High in monounsaturated and polyunsaturated fats, avocados may reduce blood cholesterol and heart disease risk. 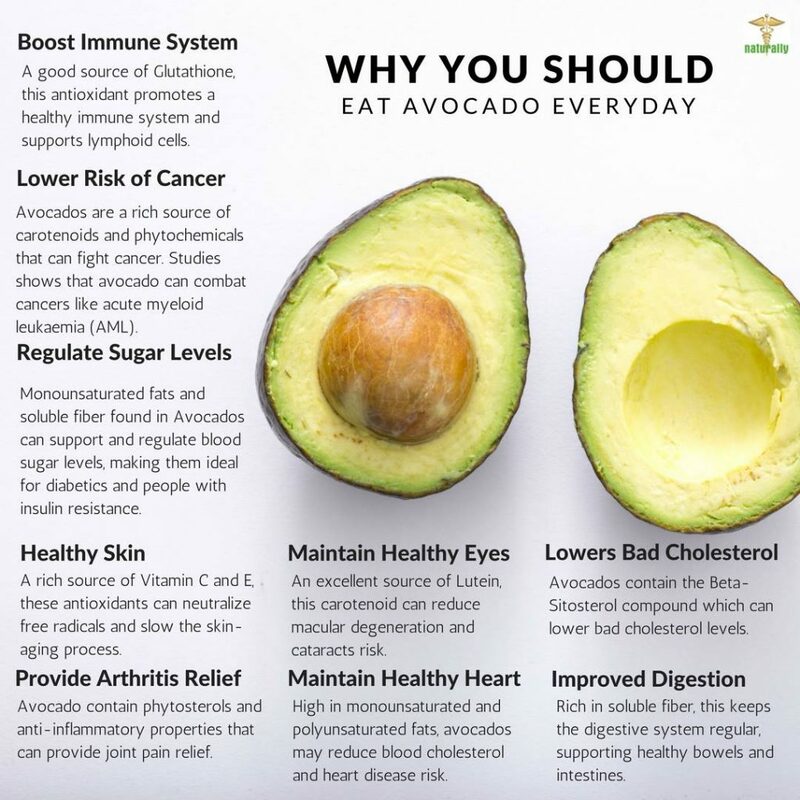 Avocados are an excellent source of Vitamin B6 and Folic Acid that can help to regulate homocysteine leves that are associated with a higher risk of heart disease. A rich source of Vitamin C and E, these antioxidants can neutralize free radicals and slow the skin-aging process. Vitamins C and E are found in good amounts with avocados and there is some evidence that these vitamins may even be useful in treating psoriasis. A good source of Glutathione, this antioxidant promotes a healthy immune system and supports lymphoid cells. Eating avocado can strengthen your immune system, while lowering your cholesterol, heart disease risk and weight management. Avocados contain the Beta-Sitosterol compound which can lower bad cholesterol levels. Along with increasing good cholesterol levels, avocados have been found to be especially beneficial for people with mild cholesterol problems. 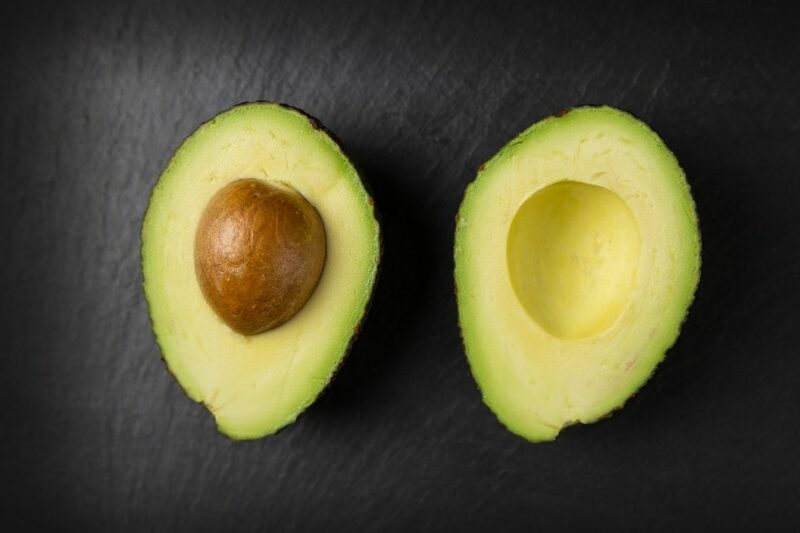 A study in the “Archives of Medical Research” discovered that after seven days of being on an avocado-enriched diet, hypercholesterolemic patients showed a 17% decrease in total cholesterol levels. This includes a decrease in LDL cholesterol of 22%, along with an increse of 11% in HDL cholesterol. Avocados are a good source of folic acid, essential for protecting against birth defects and your baby’s brain and spinal cord. One study published in the journal Nutrients, examined the role of avocados in the diets of pregnant and lactating women. The study found that “Avocados are unique in that they contain much higher amounts of the key nutrients folate and potassium” which is normally under-consumed in maternal diets. Avocado contains phytosterols and anti-inflammatory properties that can provide joint pain relief. This may be beneficial for individuals suffering from chronic osteoarthritis and rheumatoid arthritis – debilitating diseases that can cause extreme pain for the individuals affected. Avocados can support your pain relief efforts by cushioning the tissue between joints. With all these amazing avocado health benefits, we want to know – How do you eat yours? Let us know in the comments below! Over 36 books available on FREE download to help you reach your health goals. Covering everything from how to simply keep on top of your health right through to serious health recovery, download your free book instantly today. Expect expert advice on how you can keep on top of your own health and a 30 day plan for guidance.